From Wikipedia: "Little Dedo is a small gargoyle with pointy ears and human-like feet on the Notre Dame Cathedral. When the cathedral was built in 1160, a nun from a tiny convent in Provence who disliked the menacing gargoyles that were put on top of the building to ward off evil spirits, disguised herself as a workman, gained entrance to the work site and quickly carved the sculpture from a small block before placing it on the highest roof. The gargoyle was undiscovered for centuries until a small boy, lost in the labyrinthine structure, stumbled off a ledge and rolled down a roof into the arms of the gargoyle. Since its rediscovery, the creature has been affectionately known as Little Dedo, the gargoyle with the crossed toes." I modeled this not as an exact replica, but one would certainly recognise it as a copy. 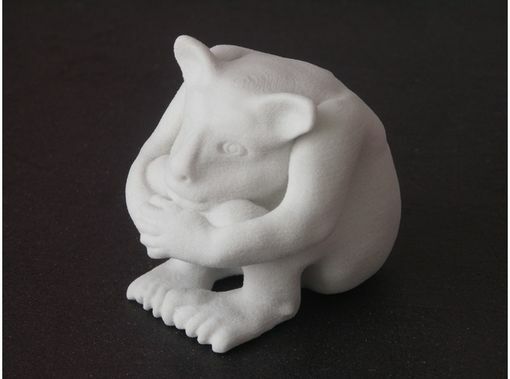 The photo shows the model printed in Sandstone. Cost shown is for this piece only. Any custom work to be discussed.